What is a gear ratio and gear inches? How does the bike gear ratio calculator work? Our bike gear calculator may help you in choosing chainrings and cogs. Many contemporary bicycles have multiple gears and thus many possible bike gear ratios. Select the range of interest and check which combination is best suited to your cycling preferences and conditions. As a result, you will get the tables in gear ratio and gear inches units. For example, if the number of teeth is even, the gear ratio equals 1. For 50 teeth in front and 25 in the back, the gear ratio is 2. For bicycles equipped with hub gears, the gear ratio also depends on the internal planetary gears within the hub, so gear ratio is not a good measure when planetary gears are involved. Why don't we use the chainwheel and rear sprocket teeth values as a measure of a gear? Let's answer with the question: do you know instantly that 39/14 is the same gear as a 53/19? Probably not. That way of showing the ratio is inconvenient and can be confusing. One value explaining taht the gear ratio (or gear inches) for both combinations equals 2.79 (or 78) is much easier. Choose the minimal value of the teeth in the chainring. Let's say it's 42. Pick the maximum number, 48 for example. Analogically, select the range for cogs teeth, for instance 10 to 24. If you want to see not only gear ratio but also the gear inches table, enter the wheel diameter in inches. Great! 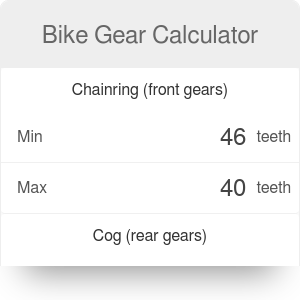 Bike gear calculator displayed two nice tables with gear ratios and gear inches for all combinations in chosen range. Ready for a bike trip? Check our other calculators for cyclists, such as calories burned biking, biking life gain or car vs bike. Bike Gear Calculator can be embedded on your website to enrich the content you wrote and make it easier for your visitors to understand your message.